Noah Vedral took his first snaps as a Husker Saturday afternoon. He’s far from the first Vedral to accomplish that feat. His father, Mike, was a tight end for Nebraska in the early 90s. Three other uncles also suited up for the Huskers – Jon, Mark, and former quarterback Matt Turman – Noah Vedral’s maternal uncle and current head coach of Omaha Skutt’s football team. “Running out of the tunnel walk for the first time, knowing that I had a chance to play today, knowing that I had uncles, and my dad did it before me, that was a really cool moment,” Vedral said. It was a long time coming for Vedral. Nebraska didn’t offer the C-1 dual threat QB out of Bishop Neumann, so Vedral packed his bags for Central Florida to join up with fellow Nebraska native, Scott Frost. Vedral spent the year as backup to McKenzie Milton. Once Frost was hired at Nebraska, Vedral followed suit, both men uniting to come back to their home state. Due to NCAA transfer rules, Vedral was going to have to sit out the entirety of the 2018 season. After the departure of Tristan Gebbia to Oregon State and Adrian Martinez’s knee injury he sustained during the Colorado game, the Huskers scrambled to secure a waiver from the NCAA to allow Vedral to play. The request went ignored for weeks. According to the Omaha World-Herald, UCF failed to acknowledge the transfer request, which delayed the proceedings to Nebraska’s detriment. However, just as Nebraska was set to take on Northwestern, the waiver was granted by the NCAA, making Vedral immediately eligible to play. He would have to wait another couple of weeks, but finally on October 27th in front of nearly 90,000 fans, Vedral made his debut. It wasn’t flawless, but it was far from a disappointment, either. Going just 2-9 through the air for 29 yards, the lack of playing time showed for the sophomore. But none of that will matter for Vedral, who scored on a dazzling 20 yard dash that was capped off with a diving reach over the pylon. His coach shared his enthusiasm. 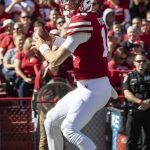 “I know growing up here, when I was little all I could think about was scoring as a Husker and it’s been kind of a weird path for him to get here, but it was great to see him diving into the end zone at Memorial Stadium,” Frost said. The two men, inextricably linked, will know more than anyone that there really is no place like home.